VON FURSTENBERG Diane, The woman I wanted to be, New York, 2014 ; VON FURSTENBERG Diane, Diane. A signature life, New York, 1998 ; DILIBERTO Gioia, Diane von Furstenberg. A life unwrapped, New York, 2015. Lili Nahmias was born in Thessaloniki, Greece, on 17 July 1922, as the daughter of Moise Jacob Nahmias (b. 18/07/1878 in Thessaloniki, Greece) and Diamanté Cattan (b. 10/04/1885 in Thessaloniki, Greece). Lili had two older sisters : Julie or Juliette (b. 21/05/1913 in Thessaloniki, Greece) and Mathilde (b. April 1916 in Thessaloniki, Greece). The Nahmias family emigrated to Brussels, Belgium, at the beginning of July 1930 and became prosperous. Father Moise Nahmias worked at Maison Dorée, a very luxurious textile shop. He was therefore able to afford a comfortable home in the more upscale part of the Belgian capital and youngest daughter Lili dreamt of going to college. Before the war, middle daughter Mathilde Nahmias married a Spaniard and moved to Paris, France. The other members of the Nahmias family still lived in the Belgian capital when Nazi-Germany invaded Belgium on 10 May 1940. Lili fled to France in the company of her aunt Lina Cattan and uncle Simon Haim. They settled in Toulouse, France, where Simon introduced Lili to the Romanian electronics salesman Lipa (Leon) Halfin (b. 10/03/1912 in Kichinev, Romania, today Chișinău in Moldavia), who had emigrated from Romania to Brussels in 1929. After the situation in Belgium stabilized in the summer of 1940, Lili returned home to Brussels. At the end of that year she and her parents registered in the municipal Jewish register as was obliged after the first anti-Jewish measures of October 1940. Lili was then placed with a Christian family in Auderghem. The couple was involved in the resistance, which led Lili to join the clandestine group as well, distributing forged papers. In July 1943, Lili’s parents Moise Jacob Nahmias and Diamanté Cattan were driven out of their home and were forced to move in with their oldest daughter Julie and her husband Dario Levi (b. 05/04/1908 in Thessaloniki, Greece). Lili, who was also officially registered at her sister’s home, remained in contact with Leon Halfin via mail. Leon had been able to flee to Switzerland in August 1942 and would survive the war in a labour camp near Lausanne. When he proposed to Lili in a letter in 1943, she immediately replied and said yes. Lili Nahmias was arrested on 5 May 1944 by a German-Belgian police unit at the apartment where she was staying. She was taken to the headquarters of the Sicherheitspolizei-Sicherheitsdienst (Sipo-SD) at Avenue Louise in Brussels, where she spent the night before being transferred to the Dossin barracks in Mechelen. 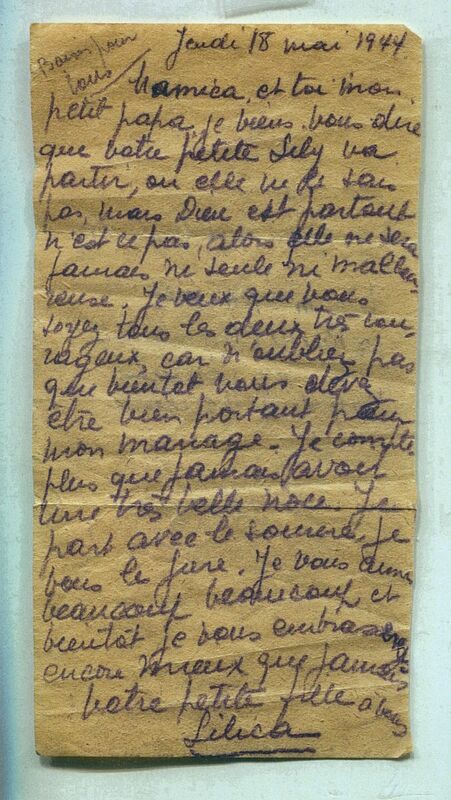 From this transit camp, she wrote at least one letter to her parents who had been placed at the Jewish elderly home Scheut in Anderlecht on 6 May 1944, after also having been arrested by the Sicherheitspolizei-Sicherheidsdienst. Because of their age, Moise and Diamanté were not deported. Both survived the war at the Scheut facility and returned home in November 1944. On 19 May 1944, Lili Nahmias was deported as deportee 407 on Transport XXV. She threw a leaflet with a short note from the train en route, addressed to a non-Jewish neighbour of her sister Julie at Rue Haute in Brussels. Julie, her husband and son would survive the war in hiding. When the train carrying Lili arrived at Auschwitz-Birkenau on 21 May 1944, she was selected as a forced labourer. The number 5199 was tattooed on her left forearm. Lili survived slave labourer at a munition factory in Auschwitz main camp and Birkenau, and the death march to Ravensbrück in January 1945. Lili Nahmias was liberated at Neustadt on 5 May 1945 by the American army and was repatriated to Belgium on 23 May 1945, where she was reunited with her parents and her sister. Her fiancée Leon Halfin returned from Switzerland on 1st July 1945. On 10 November 1945, the couple married in Brussels. Lili and Leon would have two children, who were both born in Ixelles, Brussels : daughter Diane Simone Michèle Halfin on 31 December 1946 and son Philippe Michel Halfin on 13 December 1952. Lili Nahmias passed away in 2000. Her son Philippe still lives in Belgium, her daughter Diane lives in the United States. Diane von Furstenberg, daughter of Lili Nahmias, kindly provided copies of the documents in this collection to Kazerne Dossin during a visit to the museum in March 2017.